Trams have been brought to a halt in the city centre by a major power outage. The tram service reported a “significant technical issue in city centre” at around 10am, affecting most of the line. Trams were initially only running between the airport and Edinburgh Park, but have now resumed service as far as Murrayfield. Stops not currently being served are Haymarket, West End, Princes Street, St Andrew Square and York Place. Engineers are currently investigating the cause of the fault. Tickets are being accepted on Lothian Bus services. 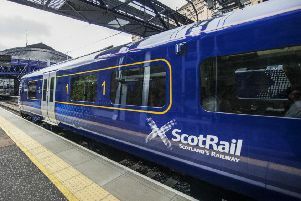 A Transport for Edinburgh spokeswoman said: “Trams are currently running between the Airport and Murrayfield due to a power failure at the west end. Engineers have been working to resolve the issue since the fault occurred this morning. “Lothian Buses and Airlink have been accepting tram tickets since the incident occurred. “We will be running as far as Haymarket from 4pm and are working towards running the full route from 7pm tonight.